In a previous article, we introduced you the protecting counters PROTECT LINE® by Italmodular. It’s a protecting system for refrigerated counters in supermarkets and in shopping centres from the impact of carts and good trolleys. The company Italmodular now presents the new line of protector poles for forklift trucks. Italmodular is an innovative company, leader in the sector of commercial modular shelving solutions. 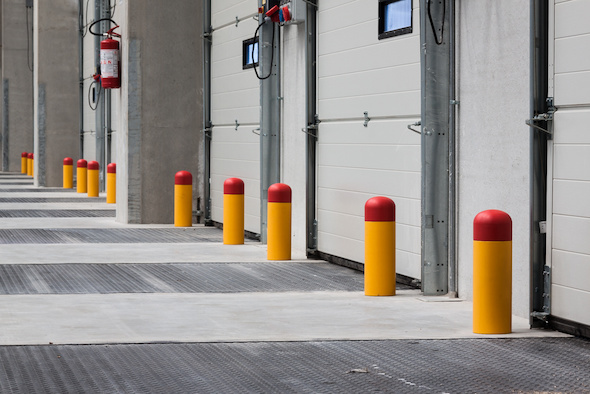 It’s a reliable partner for the designing of high quality and innovative storage facilities. For this reason, the company will allow you to use the storage spaces, of every working place, in a smart way. The long experience, the investments in technology and human resources and the international customer support system make Italmodular a point of reference in the marketplace. It’s a highly efficient and reliable company which is always available to satisfy different customers’ needs. Our collaboration is based on values like trust, professionality and ethics, both towards people and the environment. As a matter of fact, Italmodular follows an environmentally sustainable strategy, based on Corporate Social Responsibility principles. Italmodular’s aim is to optimize your business. For this reason, it offers a wide range of commercial modular shelvings, which can satisfy the different needs of the customers. They are made from anodized aluminium alloy or stainless steel. 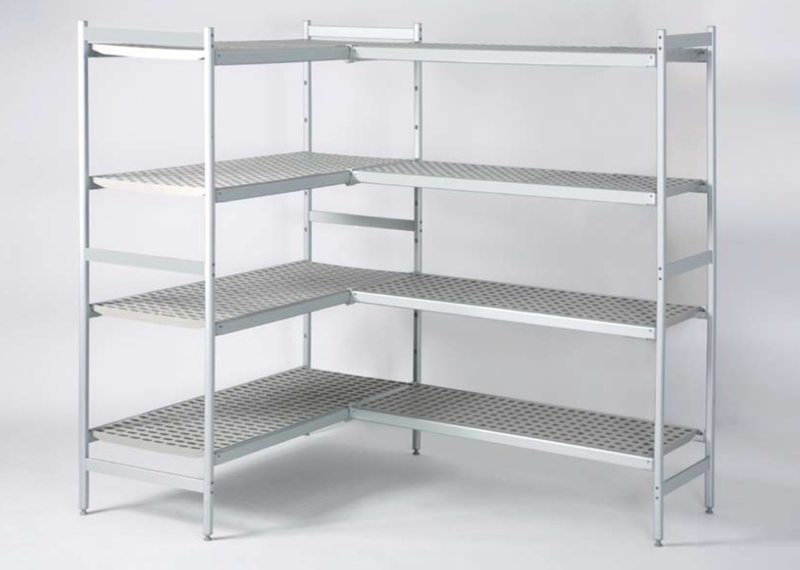 These shelving solutions are highly resistant against corrosion by water and collisions. Moreover, they guarantee high standards of hygiene, thanks to their smooth and rounded surfaces, the closed profiles and the total absence of gaps and cracks in which dirt can lurk. The overhead sliding shelving is the perfect solution to increase the available storage spaces. 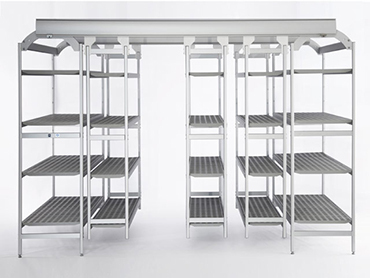 As a matter of fact, its innovative overhead sliding system, which runs smoothly and quietly, allows the increasing of the storage surface area by between 25% and 90%. The modern and elegant design, the stability and the great load capacity make it the ideal solution for those who need to organize and make the most of available storage space. The Easy Compact shelving is the ideal solution for those who need to organize and to increase the available space, especially in mid-to-small-sized rooms, with light loads and with a more affordable investment. Moreover, it offers a great versatility in the composition and it’s also easier to handle the materials, thanks to the central sliding tracks and to the two shelving units that act as fixed supports. The floor sliding shelving is highly versatile, allowing the organization of the space in different application areas and assuring a great adaptability. Both stable and sturdy, it doesn’t need any special fastening or anchoring. Thanks to the patented slot-together system by Italmodular, it’s very easy and fast to assemble, and can be perfomed without the aid of special tools. The display trolleys by Italmodular are spacious, light and the ideal solution for different demands. They are the innovative version of the manual transport of our modular shelvings. Their task is to allow the display and the storage of goods. It’s possible to choose the display trolleys, in many measures and adaptable to every display need. Moreover, Italmodular offers modular trolleys, to carry goods from the unloading area to the storeroom. They work quietly and hold heavy loads. The protector poles by Italmodular are an innovative system that makes the working environment safer. They are used to protect walls, shelvings and machinery from the collision of forklift. Their shape and material guarantee an easy and fast cleaning. Moreover, these protector poles assure the compatibility with every environment, even the food one. They are fixed on the floor, so they are highly resistant from the collision of carts and forklift. For this reason, one of their main functions is to protect doors, corners and edges. The protector poles can also protect people and machinery, defining the lanes where they can pass. The shelving and trolley lines by Italmodular need a protection from the collisions provoked by moving vehicles. It’s important to protect shelvings, especially for the stocked goods, which can be damaged. You can find a wide range of high quality protector poles, which can satisfy any demand. Our company is always at your disposal to satisfy your needs and answer to any question! Do not hesitate to contact Italmodular for further information.